In addition to ranking the top choices of all the respondents, as summarized in the e-mail, we also weighted the results based on a simple system in which we gave 5 "points" to each respondent’s first choice, 4 to the second choice, 3 to the third, 2 points to the fourth choice, and 1 point to the fifth. 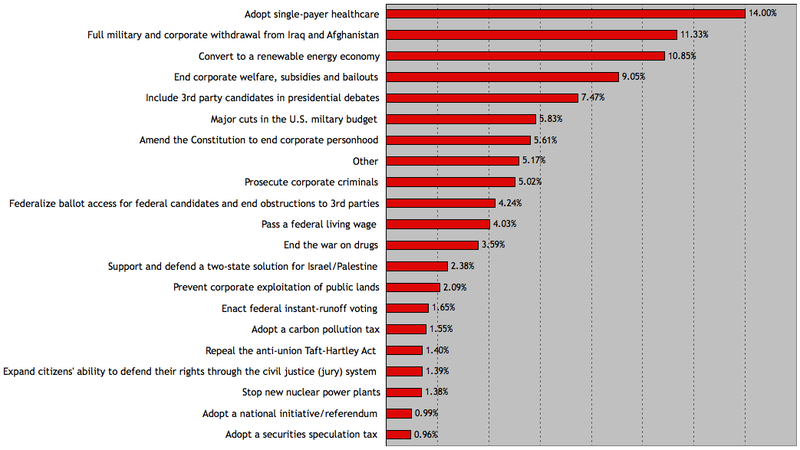 The top chart at the right (red bars) shows the percentage of the weighted total "votes" received by each of the issues. 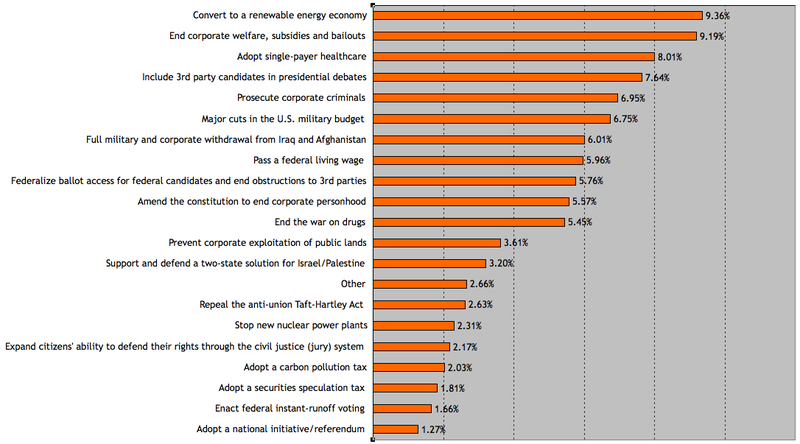 The charts that follow show the distribution of the responses in the individual issue categories from 1 (most important) to 5. Click here to download an Excel file with the raw totals and percentages for each of the twenty issues in the survey. 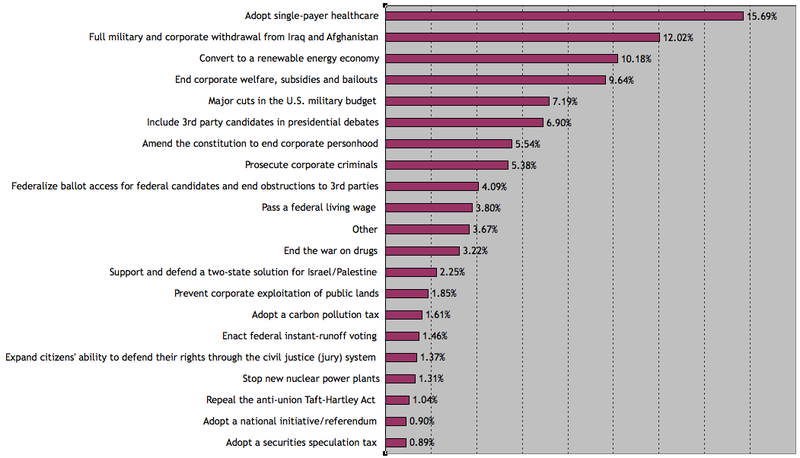 A full one-third of the respondents chose the adoption of single-payer healthcare as either their top issue or ranked it second. Almost 12 percent picked it in one of the five slots, also giving that issue the highest raw total. Withdrawal from Iraq and Afghanistan, when combined with major cuts in the US military budget, shows a strong preference for peace, in addition to good health. 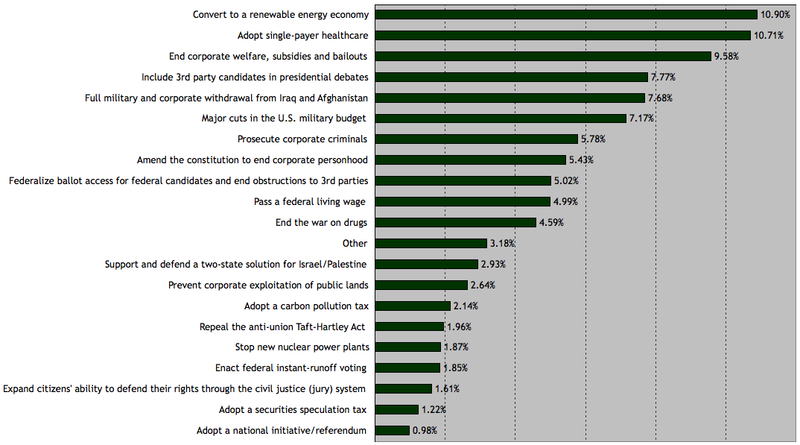 Third in the weighted total rankings is the conversion to a renewable energy economy. Stopping nuclear power plants and enacting a carbon tax were not highly popular avenues for accomplishing this goal, which would seem to anticipate the intense debate that will take place over the coming years on just what will be required to put the US and the world on a sustainable energy footing. 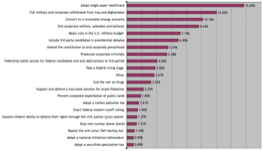 There is a broad consensus among the respondents in favor of corporate reform, re-regulation, and sanctions and supervision as remedies for increasingly evident corporate malfeasance. Many people expressed, as their alternative top issue, a desire for broad and sweeping improvements in the state of our democracy. That desire was a major theme of the Nader/Gonzalez campaign, but is hard to quantify. 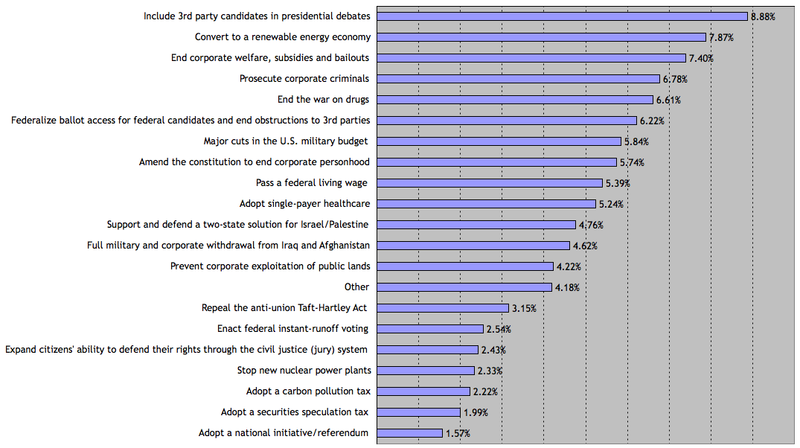 Many also listed impeachment and/or prosecution of administration officials, fair trade policies, and jobs and the economy as "Other" top issues. 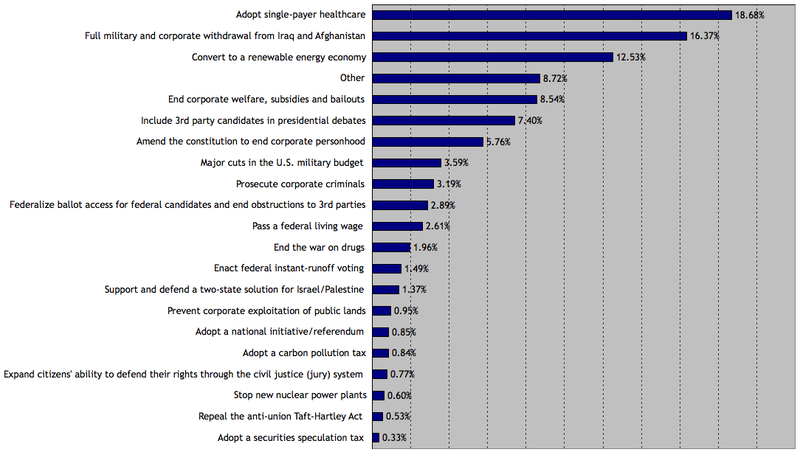 These were also campaign priorities but did not make the list. There were a large number of policy suggestions put forward on the general topic of the Environment (including global warming, sustainable agriculture, animal rights, water conservation). Reform of Campaign Finance and "Operations"
LGBT and Reproductive Rights — all sides and a wide variety of opinion. Formation of a "New Party"
Re-regulation of credit and tightened standards (no suggestions they be loosened).